A bus driver has raised more than £2,000 to thank hospital physiotherapists for helping his wife recover from a massive stroke. Dave Gray, who works for East Yorkshire Motor Services (EYMS), walked more than 20 miles from the firm’s Anlaby Road depot to Hornsea bus depot with his friends and workmates Graham Franklin and Andy Cope to thank staff for saving his wife Denise. The couple’s daughter Danielle said: “We just can’t thank staff enough for all they’ve done, not just for my Mum but for all of us. Danielle found Denise, 50, unconscious in bed when she went round to their home one morning in April after her mother failed to answer the telephone. 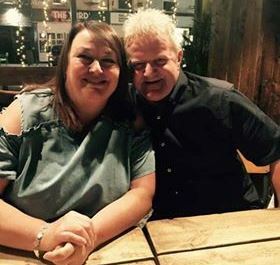 Denise, who worked as a cook in a care home and had been at work just two days before, was rushed to Hull Royal Infirmary where emergency doctors discovered she had suffered a massive stroke. Dave, Danielle and her brother Martin were told to prepare for the worst. Within an hour of arriving at hospital, Denise was undergoing brain surgery and then spent 10 days in Intensive Care. She was taken to the Hyper Acute Stroke Unit on Ward 110 and then Ward 11 to continue her recovery. Danielle said: “Right from the start, her physio Dan Pearce was amazing and we are just so grateful to him. With Dan’s support and the care of the nursing team, Denise relearned some of the skills she had lost when she had the stroke, learning how to support herself, sit up and hold things during her 15 weeks in hospital. She has now been discharged and is continuing her rehabilitation at Rossmore Nursing Home in Sunnybank, going from strength to strength. Dave and his friends carried out the sponsored walk between the two depots to raise money for the physiotherapy team as a way of thanking them for their help. They have now returned to the stroke unit to hand over the donation.